Water is one of life’s basic necessities. Without it nothing can thrive. It is little wonder, therefore, that from prehistoric times, water has been regarded not only as as a precious substance, but also a magical substance. For ancient man it seems certain that wells, springs and pools were accredited with healing powers long before the Christian era, and the custom of visiting “ holy wells” on the days of the saints who had blessed them can be traced back to a pagan water-cult of much more ancient times. 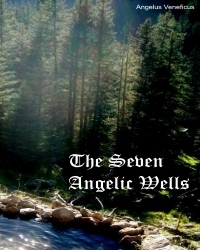 By creating the seven Angelic Wells and performing the seven ceremonies which invoke only angelic powers, these you can use to ask for help and guidance from the appropriate archangel. "Ask and it shall be given unto you. Seek, and ye shall find", these rituals are but a way of asking. You will be guided on how to produced the seven well talismans of the archangels, which are used to dedicate and consecrate the individual Well to the appropriate archangel. These archangels being the traditional angels of the planets; Michael, Gabriel, Samael, Raphael, Sachiel, Anael, and Cassiel. - Each Well is a direct link to the archangel that you created it for. It is a source of power and an area to be used for contemplation and mediation. - When feeling a little low you may visit the appropriate Well and request that archangel for assistance and guidance. - If you have a particular problems, find out which Archangel rules the area of concern and again request the Archangels help and guidance. At the appropriate astrological time, your may welcome the Archangel to his Astrological cycle, again generating a powerful link to the Archangel. You may perform simple or elaborate spells at your Wells, as are described in the eBook.